WE ARE… Counting the Days! As Wellesley counts the days to the end of the fiscal year, we are excited by how many alumnae—from every generation—have participated by giving a gift to the College this fiscal year. Participation levels have already earned Wellesley a bonus of $200,000 via a donor challenge and that bonus could be even bigger with your help. If you haven't given yet, there's still time. 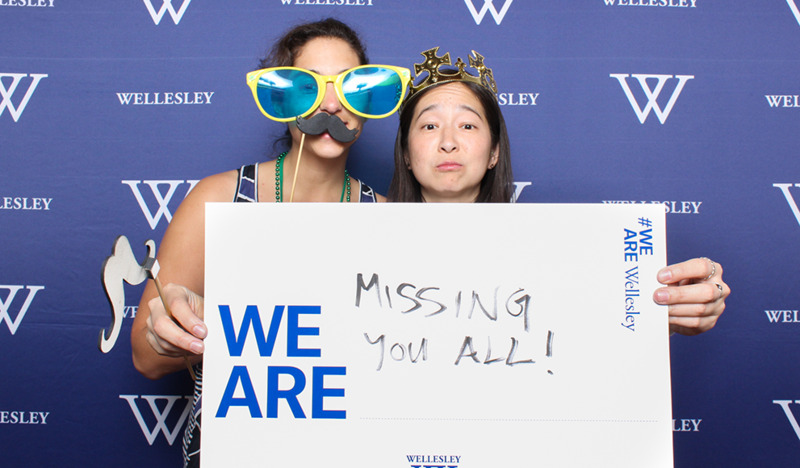 On June 1, Wellesley launched the month-long We Are Wellesley participation challenge. The terms are simple: A group of donors who believe in the power of a Wellesley College education have pledged to give an additional $500,000 to the College if Wellesley can achieve 54 percent alumnae participation in giving this year. The rewards are incremental: For every 5 percent increase in participation from mid-May through the end of the fiscal year on June 30, 2015, the Wellesley Fund receives an additional $100,000, thanks to these generous donors. As of June 26, we’ve reached 42 percent participation -- we need a few more participants to max out the challenge (54 percent participation and $500,000) before 12 midnight on June 30! If you’re an alumna and haven’t made a gift to Wellesley since July 1, 2014, go online, call, or text to give. Any amount counts toward participation and every gift is important. If you have already made a gift, we thank you! Now, please nudge that former roommate, teammate, friend, or Wellesley sister who may not have gotten around to giving yet. There are only a few days left to exponentially increase the impact of a gift by participating in this challenge. This wonderful opportunity to garner an added $500,000 will help keep Wellesley strong for this and future generations. The financial part is vital, but so is the fact that we are stronger together, and participation unites us. For example, during Reunion, at the start of the challenge, many gifts came with the expression, “WE ARE… paying it forward.” These participants were eager to help guarantee that the education they received will be available to the next wave of Wellesley students too. Wellesley gratefully accepts donations from all sources, but for this particular challenge and to meet that gold standard of 54 percent participation in a year, it’s alumnae we need to really “make a difference.” Your support now will have an amazing impact.